For those of you eagerly awaiting the arrival of Sony's Sountina uni-speaker, don't hold your breath – it won't be hitting the UK until after Christmas, if at all. 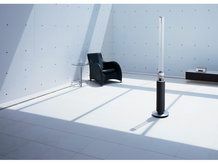 The stylish glass tube speaker was on display at Sony's showcase event in London, but TechRadar was told that there were no plans to bring the speaker to the UK as yet. But Santa, I wanted one. This means that the high concept audio device will certainly not be part of Sony's UK Christmas product list and, as far as we could ascertain, may not arrive on these shores until much later or indeed ever. Which is a shame because the expensive speaker is certainly a talking point – with its blue glow and unusual looks boosted by crystal clear sound. The downside of the speaker, as you may realise, is that to get the full experience it should be placed in the centre of your room.